Nevada has long enjoyed a multitude of local brewpubs, but never its own distillery. George and Katalin Racz hope to change that next month. 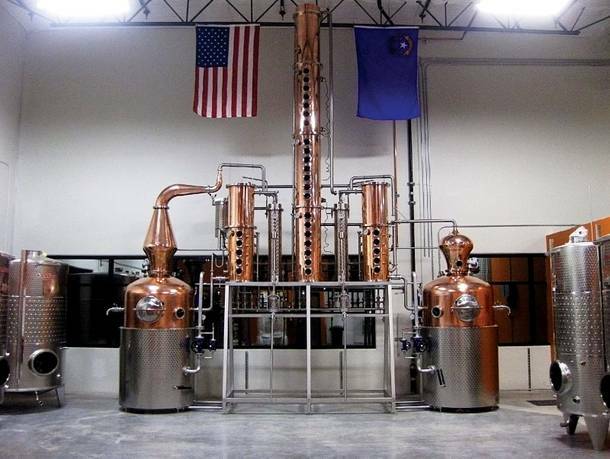 After two years of hard work, they’ve got everything in place to open Las Vegas Distillery at 7330 Eastgate Road in Henderson—including two “pot stills” that George dubs “Rose” and “Swan.” He calls both “copper angels,” the moniker his grandfather gave his pot still back in Racz’s native Hungary. Once state and local permits are approved, the couple hopes to begin distilling whisky, bourbon, gin and vodka by late February at what George proudly describes as “a completely local operation,” right down to the wheat, rye, oat, barley and corn used—it’s all coming from Winnemucca Farms in Northern Nevada. George says he chose Nevada because it’s one of the few remaining states without a distillery. “My family said we’re crazy, and I arrived in the United States eight years ago to do something new. We’re holding onto this crazy idea to have fun.” He’s currently negotiating with local distributors, but is also hoping to sell his product directly from his operation, as well as offer tastings there. Much of that will depend on the fate of a bill draft request from the Assembly Committee on Commerce and Labor (bill draft 649), which provides for licensing and operating distilleries in Nevada.